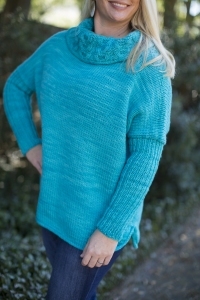 This yarn only kit is for Kate Oates' Katy Tunic. Be sure to purchase the pattern directly from Kate on Ravelry as it will not be shipped with the yarn. This pattern is the Katy Tunic by Kate Oates. Size US 10- 16" & 40" circular needles (or size needed to obtain gauge), stitch markers, and a cable needle are required but not included. Finished Chest: 50.75 (55.5, 61.25, 63.5, 71.5)", To Fit: 30 (35, 40, 45, 50)" Chest, . Gauge: 14 sts and 20 rows per 4" in stockinette. Color Shown is La Regina.